While the Ut'ja are humanoid, many features of their anatomy differ remarkably from that of humans. 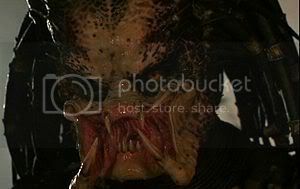 Notably, they have four mandibles surrounding their mouths. These mandibles appear to be the source of audible clicks and chirps used in communicating, although utja can also understand and mimic human speech reasonably well. It has also been suggested by many analysts that their mask provides translation capabilities. Utja have rubbery tube-like "hair" strands which appear as thick long "dreadlocks" surrounding their heads. There is mention in literature that these are ritually bound in an extremely painful process done over a month's time. This is done as a rite of passage, and if the young Utja indicates any sign of pain, it must be restarted. The males give off strong musk when in breeding season or agitated into hunting mode. They are also able to father offspring over the entire course of their adult lives. The females are attracted by this musk and the love begins. Female are known to sometime kill the male for unexplainable reasons. Some older specimens also exhibit spike-like facial hair. It is unknown if they can shave these hairs or whether the facial hair is just a matter of genetic expression, present in some individuals and absent in others. In addition to their alien exterior, utja also have notably luminescent green blood. Male Utja are estimated to be 6.5 to 7.6 feet tall (1.96m to 2.32m) and weigh approximately 300-400 pounds (136.08-181.44 kg). It is unknown how large the females are. Physically, the utja are remarkably resilient. Physical trauma that would otherwise maim or kill a human being is typically little more than a nuisance or a temporary incapacity for an utja. Lesser injuries may have no noticeable effect at all. Utja have demonstrated that they can continue to engage opponents even after suffering the most grievous of injuries, such as chest impalement or limb amputation (though these wounds may ultimately prove fatal). The Utja possess great physical strength in comparison to humans; they rip out the skulls of their prey, are able to lift tree trunks, smash small tree branches into pieces, break down walls, and throw a large-sized human 15-20 meters with enough force to incapacitate or kill. They are remarkably agile and athletic for creatures their size, often jumping vast distances and surviving drops from significant heights. An Ut'ja is also surprisingly fast. Victims who have survived an Onslaught from an Ut'Ja say they have clocked them at about 2 times faster than the Average Human. This species carries a Phaser Type weapon on its shoulder but prefers its bladed weapons and is very skilled with them. It uses these Weapons to Hunt other species and the Metal used on these weapons however is not Impervious to Im'Anitas acid blood. Recent Reports have indicated that they consider killing a sport and will not use weapons if its Prey is unarmed, nor will it killed prey that is already dying from an outside cause. such as Disease, Famine etc. There is speculation that the Ut'Ja genetically engineered a race called the Im'Anitas and use it as prey to hunt for sport. Starfleet Investigations of a crashed Ut'ja ship in Antarctica on Earth discovered the Skeletal Remains of a Im'Anitas hanging on a Trophy wall in the ship. This is an intelligent species that is capable of adapting to virtually any environment and its pure strength can cause immense harm to anyone coming in contact with it. CONTACT WITH THIS SPECIES SHOULD BE LIMITED, THIS SPECIES IS EXTREMELY DANGEROUS APPROACH WITH CAUTION! More Information will be added as more Intelligence is gathered.